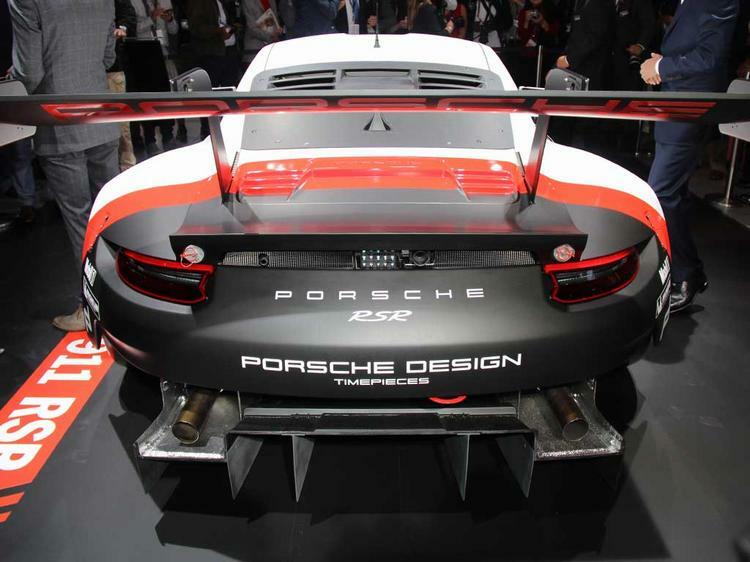 At first glance the 2017 Porsche 911 RSR revealed at the LA show last November wasn't anything too extraordinary. Wide of arch, huge of rear wing and all the rest but still recognisably a racing 911, albeit the most extreme of its type. Then the WTF moment - they've done WHAT with the engine? Yup, say hello to the mid-engined 911! "It only took us 52 years!" 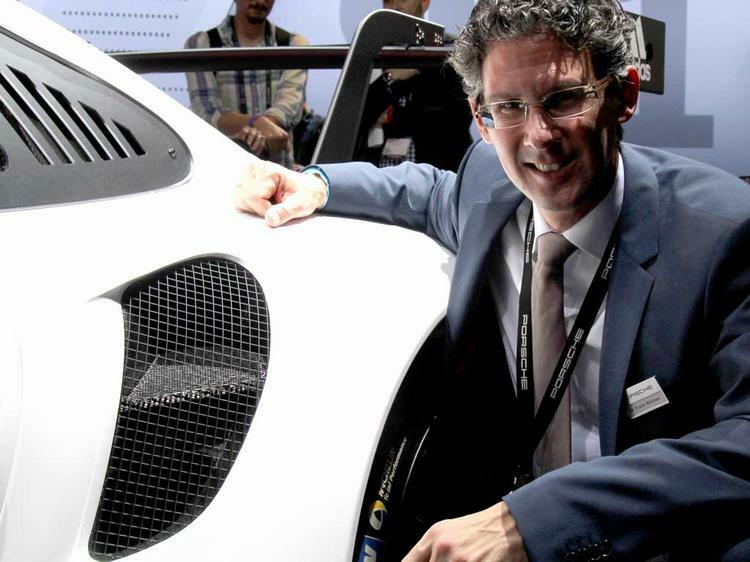 laughs frizzy-haired Porsche Motorsport boss (and former 918 Spyder development head) Dr Frank Walliser, before pointing out the Le Mans winning GT1 was also mid-engined. Emotionally that was less of a leap though. This new car is still recognisably a 911, albeit one with the engine and gearbox rotated through 180 degrees. Given the fuss among purists at road cars going water-cooled, binning the floor-hinged pedals, adopting electric steering and supposedly destroying what makes the 911 special, could this be Porsche finally accepting an engine hanging over the rear axle isn't the ideal layout for a sports car? Don't be daft. We're some way from the road car following suit. But the Motorsport department is out to win races. And rather less sentimental about what it does with the 911 to achieve that than their colleagues in the passenger car division. 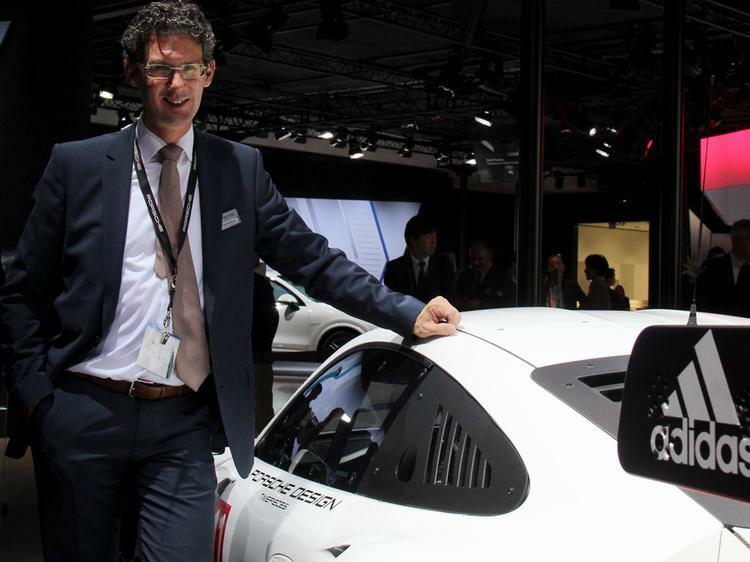 If there's a 911-shaped car at the front of the LM-GTE pack it's job done. Especially if it follows the GT1's lead and takes class honours at Le Mans. Ahead of its racing debut at the Rolex 24 at Daytona at the end of the month we thought we'd share our chat with Dr Frank following its unveiling at the LA show. To get you up to speed here's a quick run through of the RSR's highlights. Sitting at the top of the racing 911 line-up the RSR is the factory GTE car, expanding on the one-make GT3 Cup and 429,000 euros GT3 R to compete at the very highest level of GT racing in the WEC and IMSA Weathertech Sportscar Championship. Body, suspension, aero, engine and transmission are all new, the RSR finally severing the link to the Mezger engine and adopting the 4.0-litre version of the direct-injection flat-six derived from the GT3 and RS road cars and used in the GT3 Cup and R. Depending on restrictions it runs about 510hp and drives the rear wheels through a paddle-shifted six-speed sequential housed in a magnesium casing. New features include a rear-collision avoidance system and 919 Hybrid donated top mounted rear wing. It goes without saying it looks absolutely badass too. Was it a big emotional shift swapping the engine round and making the flagship racing 911 mid-engined? "It was a great emotional thing! There were long discussions in the company. But look at the car, is it a 911; answer yes or no! For sure it is a sensitive discussion when we the motorsport guys turn up and say 'we have a good idea!' and the company says 'what are you doing?!' - they take care of our heritage." And what exactly was the main motivation for doing it? "We had a close look at how we can keep the car competitive and what is necessary to win the championship and win a race. At the WEC races and the IMSA races tyre wear is one of the most important things and this was definitely something we could improve from the old car. So we had a very close look at the weight distribution as this influences a lot the tyre wear and how the car handles. And we came up with the decision to have the engine more to the front and have it before the rear axle." So it's 'just' a case of turning it through 180 degrees? "Yes. Simple! 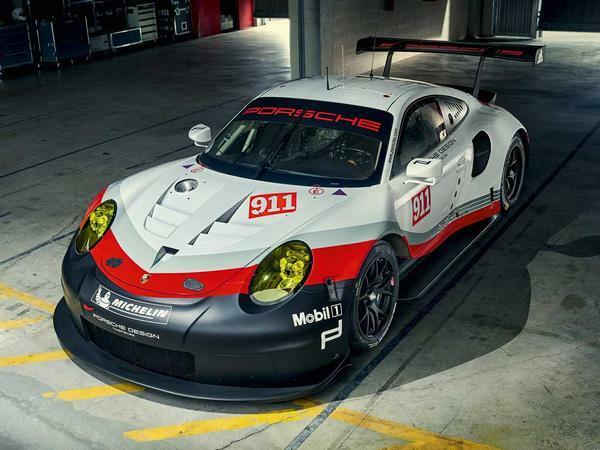 [Laughs] It's a race car, we did it in GT1 also so it's not new for Porsche, the wheelbase is also longer than GT1 to give an idea of the dimensions. This gives you more freedom with the aerodynamics, with the rear diffuser and, for sure, all the experience we gained in the last four years in WEC and three years in IMSA, all the small bits and pieces it's all new ... the door handles carry over I think! 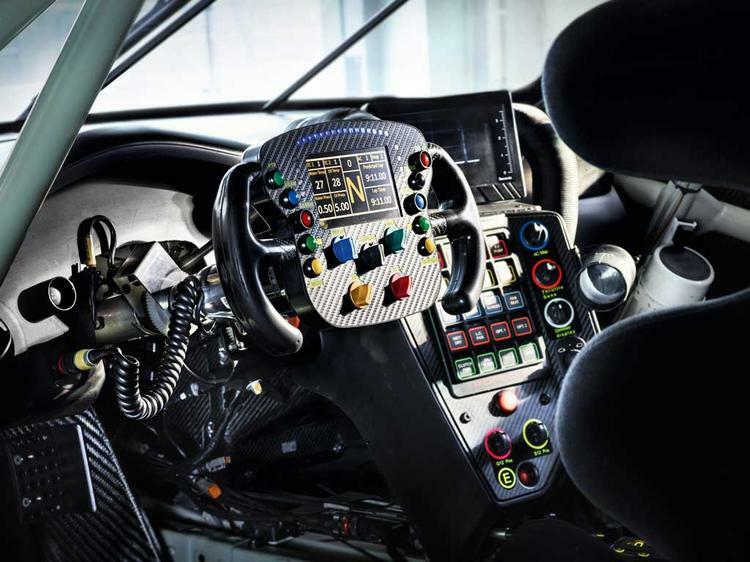 It's also a new engine - our switch over from the old Mezger to the new direct-injection GT3 engine generation is now done so we have the Cup car, the GT3 R and this car all on the new engine." How big a handicap was it previously having an engine where you should have had a diffuser? "For sure it is not the perfect layout. For the street car you have this 2+2 layout and this spacey feeling, this is why we love the 911 and why it's so successful for the last 52 years. But if the rules give you the freedom, why not? Just do it." Did you consider going all-in and swapping to the four-cylinder turbo? "We also had a close look at the turbo but the disadvantage on the weight side made us stay with the normally aspirated engine. If you look in the competition it's 3.8, 3.9... this is appropriate size. For a turbo to come with a 2.5, it's too small." How closely related is the RSR to the street versions? "You have so called free volumes where you can change the car, like the width. But there are some shapes you have to keep so you see the exact rear wing is the 911 GT3 RS, this is the car which is the homologation basis and you see in the roof indent too. The RS is the technical basis for this car." Do the drivers like it? "Race car drivers mainly complain - that is their job, you never get feedback saying it is OK because then they think the team will stop working! But after last testing the feedback was overwhelmingly good. It goes in the right direction." 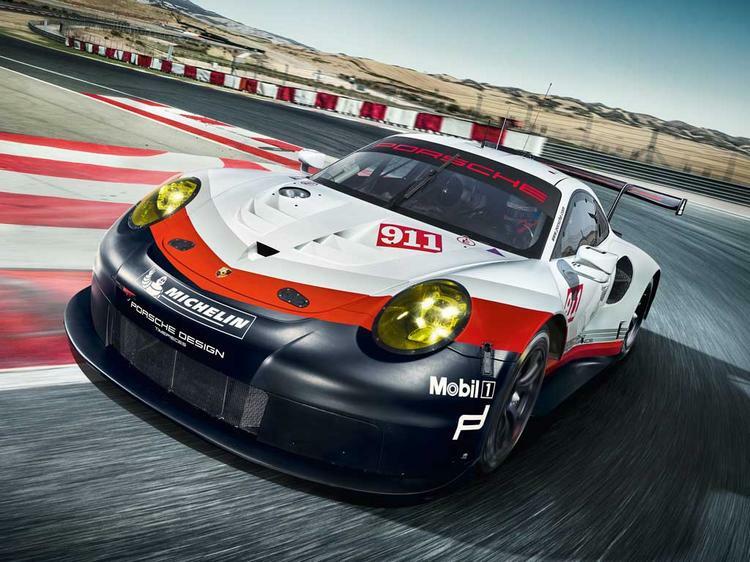 Will the RSR remain a factory car or will you be selling it to privateer teams too? "I already received the first request; they did not ask the price they just said where do I sign! But it depends a little on the rules. We built a total of 10-12 customer versions of the previous RSR, small numbers. At the end of the day we have to talk about pricing, not cost. We have to look at the market; maybe we will not sell the car but lease it." Tell us about the rear collision detection system - does this make the car less fatiguing to drive? "We have a camera and radar; the radar detects the object coming to pass you and then the camera has a monitor with an arrow to say what is coming - red if it is an LMP1, blue if it is an LMP2, and it shows whether it comes left hand side or right hand side." Is this a response to a specific incident? "We had one in Silverstone [the factory 919 Hybrid hitting a Gulf 911 RSR and taking both cars out of the race - Ed.] but a big speed difference is less dangerous than a low speed difference; we had one at the Nurburgring and this was a low speed section, I always say to the LMP guys the auto disappear button does not exist! It's just a warning though." And what does it say if it's another GTE car? Drive faster? [Laughs] "If another GTE car shows then we are in trouble!"